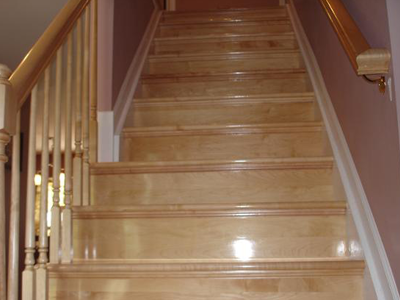 Are you looking for an easier way to refinish carpeted staircases? If so, we have the solution for you EZTREAD®! This easy-to-install staircase refacing system will give your customers' interior steps a stunning, hardwood look for an affordable price. Our stair treads, risers, and other parts come in an assortment of wood species and finishes to match existing wood flooring. We can also customize stains. Visit a retailer near you to view sample displays, stair treads and risers on both open and enclosed staircases, and before and after pictures of past installations. Our products can be used by any customer, including house builders and flippers, flooring contractors, and home improvement specialists. 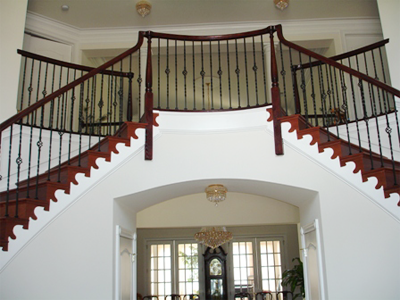 Please reach out to us if you have questions about our staircase refacing system. We're always glad to assist you. If you are interested in being a retailer, there are still territories available, and we are always looking to add distributors to our team. Please contact us to learn more about working with us. Order EZTREAD® and other stair products today! If our retailers are not completely helpful answering all your EZTREAD questions please contact us. We want to help them help you. We will answer all your questions. Retailers please call us with any questions. (302) 440-3297. Select your state to download a PDF file of the retailers who sell and install EZTREAD. 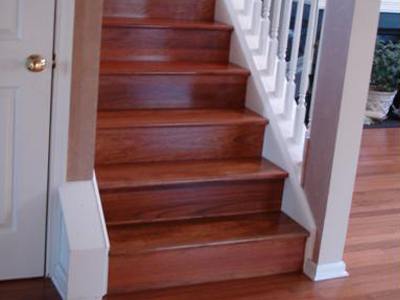 EZTREAD® is a New Castle, Delaware-based manufacturing business that designs and produces a durable hardwood staircase refacing systems, including prefinished natural wood risers and treads, which give stairs a new and attractive look. We supply EZTREAD to retail stores and work with distributors to get our products to customers in different areas. Our systems feature 17 species of hardwoods that are available in a variety of stain colors. We offer handscrapped, wirebrushed and two color techniques to compliment your floors. UV finish is offered in semi gloss. Special orders can be done in sateen and high gloss. Additionally, we provide exceptional customer service. Whether you have questions about installing our products or selling them, we're always ready to offer assistance. To ensure your satisfaction, we educate our potential customers on correct installation and maintenance procedures. Because we started installing EZTREAD® ourselves (no longer offer), we know what the installer has to face and how to help you avoid costly problems. We also provide sales support to retailers. Our goal is to make sure you know everything you need to know for easy installation so that you will recommend our products to others.